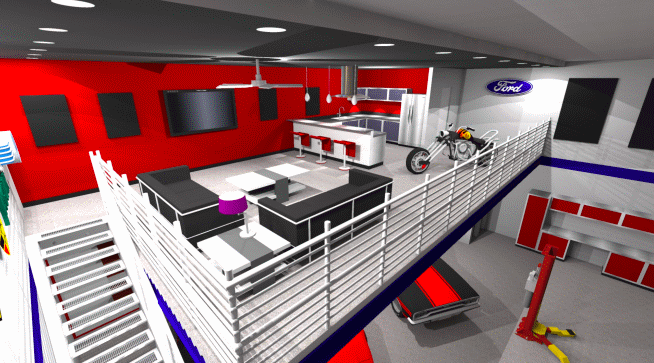 A concept drawing of what one of the condos might look like. Photo courtesy of heritagefarmsmotorplex.com. 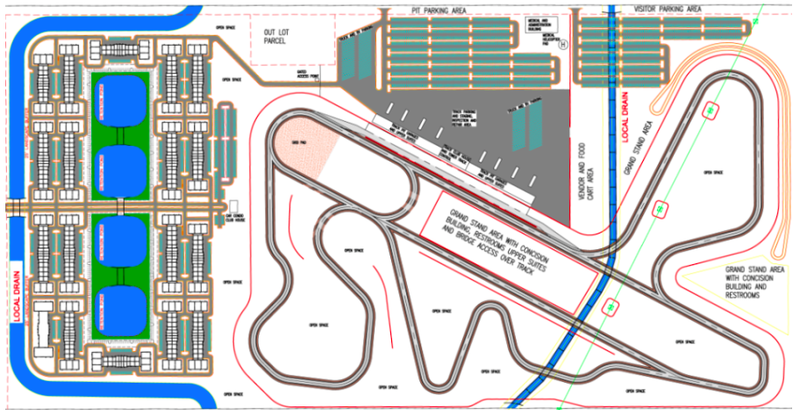 An Ypsilanti resident and former race car driver wants to bring a multi-million dollar car condo and motorplex development to the property where the failed Pinnacle Race Course once operated in Huron Township. John Ottino, who worked for 35 years with the airlines at Metro Airport and raced for over 30 years with a team dubbed the Ramchargers, says that the complex will be a place where people can work on their cars, store them, drive them, and do everything you want with your ride without infringing upon your own home. “This is the Motor City; why don’t we have something like that?” Ottino said. The proposed development, named Heritage Farms Car Condos and Motorplex, is a massive concept that will feature 522 car condos in 17 buildings. The motorplex portion of the development is a 2.5 mile road course that will include two day-garage buildings with 20 large spaces in each building, a covered spectator area, and VIP suites. Ottino, who originally got the idea for the Heritage Farms complex from similar ones that operate in Pontiac and Minneapolis, Minn., said that each condo will have air conditioning, heat, a bathroom, and can be customized depending on the renter’s needs. “If you have a large or small collection, we can handle it,” he said. Members who store their rides at the complex would have access to their cars 24/7 and can either work on them there or just hang out. “We give the members a box and they can do whatever they want inside,” he said. The property also plans to include a 4,000 square foot club house and an indoor storage space for other recreational vehicles. The course, which will have 18 turns and at least one half-mile straight, will be able to handle open wheel, sports cars, motorcycles, bicycles and go-karts. “The property is bigger than we wanted it to be, and we had to figure out what to do with the rest of the property, so we decided to add a road course,” Ottino said. Ottino, who is a self-proclaimed “car guy,” said that as the owner of two cars and a snowmobile, he needed to find somewhere to store his vehicles outside of his home. He said that he started looking around the area for places to rent or a facility that was reasonably priced where he could put his car. “I was unable to find such a place,” he said. So, he decided to run with his own development, and Huron Township had just the right spot for the complex. Ottino said the site of the failed Pinnacle Race Course on Vining Road was a perfect location for the development due to its proximity to I-275, I-94, and routes in and out of Downriver. He hopes to attract people from Ohio as well. “Being a racer, it wasn’t unusual to drive two hours just to go somewhere to test a car,” he said. The property is already zoned for the type of business that Ottino wants to operate, and utilities like water, sewer and electrical are currently available where Pinnacle once stood. “The township likes the site plan,” he said, but the township board will still need to officially address the proposal in the future. According to the development’s website, the condos will be priced from $78,750 to $360,000 depending on the size of the unit. The project estimates that it will need roughly $10 million in funding to get off the ground. “We are looking for investors and people interested in signing up for a condo,” Ottino said. Ottino is also looking for corporate sponsors to help with funding. Anyone interested should contact John Ottino at 734-355-8480 or via email at jiottino2011@gmail.com. For more information, visit www.heritagefarmsmotorplex.com. This entry was posted in Businesses, Community, Front Page News on February 18, 2016 by Scott Bolthouse. If it`s open to the public, Sure. If not good luck!